Milton Keynes-based Deli 24, the United Kingdom’s largest provider of high-pressure processing (HPP) services to the food industry, has invested £2 million in a new 420-litre HPP machine from Hiperbaric to operate alongside the company’s existing 420-litre and 135-litre machines. The investment programme has doubled the company’s processing capacity. 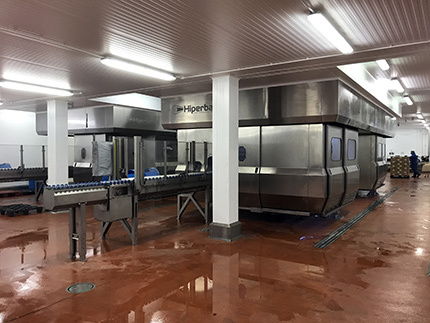 The new machine came on stream in December 2018, after several weeks of installation, commissioning and testing at Deli 24’s 5,400sq m purpose-built processing facility at the heart of the UK’s motorway network. HPP (or Pascalisation, as it is sometimes known) is based on a concept first found to be beneficial in extending food shelf life in the 1890s, but it has only been able to develop on an industrial scale in the last 20 years or so. The technology relies on the effect that ultra-high-pressure water surrounding the food product has on the cell wall structure of living organisms. HPP processing results in the inactivation of food spoilage organisms and pathogens, whilst the flavour and nutrition remain unaffected. This enables the production of premium-quality, safer, more natural products. The water pressure applied is up to 87,000psi (6,000 bar), the equivalent of being 60km under the sea, and with the earth’s deepest ocean trench being a mere 11km, it is understandable that living things struggle to survive such processing conditions. Deli 24 was formed in 2010 as a private business, employing a team comprising individuals with extensive multi-disciplinary food industry experience. This provides a collective strength in depth, with a particular focus on commercial and food safety expertise. In the eight years since the formation of the business, the plant has doubled in size. From the initial 135-litre HPP machine, in 2014 the first 420-litre machine was installed, followed now by the addition of another 420-litre machine. “This is across a wide range of foods, including meat, cheese, fish, ready meals, vegetables and pet food, along with juices,” he added. “Recently, we have also seen products aimed at the burgeoning wellness market using our toll-based HPP services, recognising the benefits of a process which extends the shelf life while having no effect on the flavour or the nutritional properties of the product,” Jeff said. “HPP is now even being used by many as a marketing opportunity, with companies actively promoting the fact that their products are HPP treated on their packaging,” he added. “This is from existing customers whose HPP treated products are achieving sales growth, as well as new customers who we are introducing to HPP as a process and helping them with their products and packaging to enable them to maximise the opportunities it presents,” he added. “This investment in another machine has been made to allow us to meet this increase in demand,” Paul said.